It is with great sadness that we announce the death of our beloved Caley. 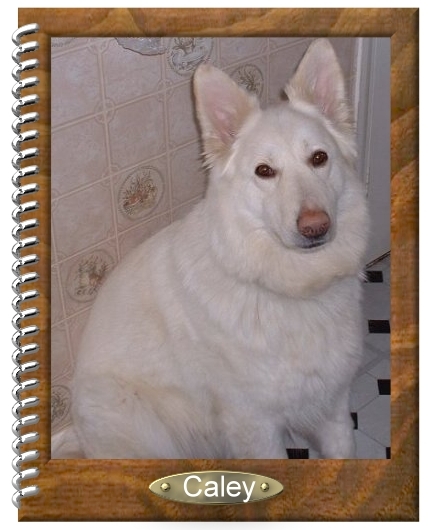 Caley, a White German Shepherd who was only 5 years old when she died, was a great character. As you have seen from the lower picture she loved to pose for the camera and thought it was great fun if she could sit with you in front of the computer and annoy you when you were trying to work. She loved attention but her greatest love in life was swimming. She took to water like a duck. It could be quite difficult to keep her out of the Caledonian Canal in Inverness, which is near to where we live. If she wasn't on the lead she would plunge into the water and literally swim like a fish. She is missed very much by all the people who knew her personally. Her owner will never get over losing her. 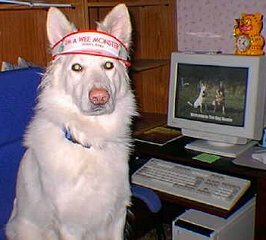 In memory of Caley this page with it's photographs will remain in place as long as Legend of Nessie site exists. This is Caledonia ( Caley for short ) A Ness-Scape family member and mascot. She is a White German Shepherd. Caley has decided to take over the editing of Nessie's Loch Ness Times, and she's sure she'll make a good job of it. What do you think?